Juliana was an incredible birth doula. From her initial visit with us and through a long labor, she was at once a calm and comforting presence and a tough advocate for our needs. Her services included two pre-labor visits during which Juliana took the time to learn about our preferences, taught us a range of comfort measures and labor poses, and provided a wealth of frank advice and insight about the labor process that I felt I had not gotten from any other sources. At the hospital, Juliana melded effortlessly with our family and the hospital staff. Throughout a tough, long labor, she worked tirelessly to provide encouragement, physical comfort, and to help me relax. She was in it for the long haul, staying through the night and coaching me through four hours of pushing (and finding the time to run out and get me flowers, too). Juliana also does a follow-up visit, about a week after the delivery. She shared very helpful advice, including nursing positions and baby-wearing, and our newborn son loved the baby massage she taught us. Her visit helped ease our anxieties as first-time parents. It was such a blessing to have Juliana as my doula for the birth of my daughter! When my husband and I first met her, we were immediately drawn to her wonderfully peaceful and calm presence. We knew from then on that she would be the perfect person to support us during birth. It was important for my husband to be a part of the entire process, and Juliana made sure he felt comfortable and involved while I was in labor. She was there when we needed her offering her assistance and advice, and she would instinctively know when to step back and allow my husband and I do our thing to get through contractions. She was there with the birthing tub, water, food, cold cloths for my face, neck massages, sacral pressure applications, and even songs! She gave me suggestions for different labor positions (we practiced them during her home visits), made sure I had warm compresses and oil applications during crowning, and she was the one who at the very end determined I had to empty my bladder so I could push my baby out (otherwise I probably would have been pushing for who knows how long!). I knew I wanted to have a doula at my birth to guide me through the process, but having Juliana by my side was so much more than that. She helped me feel confident and comfortable, and I knew that I could count on her to be my advocate when it came to the hospital staff and family visitors. Another thing that I found extremely invaluable was prenatal yoga sessionswith Juliana. I felt they made a big difference in my overall comfort during the last months of pregnancy as well as for the position of the baby. I am extremely grateful to have found Juliana. She was the perfect person to be there next to my husband and I when we welcomed our baby girl. She brings a wonderful bed side manner, extensive experience, and most importantly, sincere love for mommas and babies. Juliana helped make our birth incredible. My husband and I knew Juliana was the right doula for us when we first met with her. She was such a calming presence from the first minute. Juliana was there for me in the last trimester as I had high blood pressure and was puffy all over. She suggested herbs and diet changes to get me through the last days of pregnancy. When my doctor wanted to induce, Juliana was available by phone whenever I needed her. 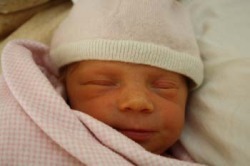 She helped us talk through the difficult decision to induce and to request a more mild induction drug from the doctor. My labor was so easy, really! Juliana and my husband laughed because between every contraction at the end, I was cheering them on and saying they were doing a great job. My whole birthing experience was so wonderful that I would have done it again the next day. My doctor told me that I shouldn't spread the word about this because my birth was so much easier than the average woman's. My husband and I worked with Juliana as our doula. She was terrific! I wanted someone who would be able to help prepare me for a hospital birth as well as support me in my needs and choices. She took the time to get to know what my husband and I wanted in our birth experiences. She helped me to make informed decisions and was supportive in my choices. She did not appear judgmental and, instead, was open to what was best for the individual. Also, she worked with me and my husband as a couple, helping him to support me and for him to feel supported. During the labor and birth she was entirely present. She seemed to know when to step in and be more hands on and when to give me more space. She came over to the house when we felt we needed her and this allowed my husband to finish with last minute items before heading to the hospital. She was very helpful in guiding my husband and I for when it was time to go to the hospital. Once there, she helped in many ways, from the mundane of parking the car to the more meaningful of coaching me and my husband while I was laboring and then pushing. She also wrote down the birth events/ birth story, which she gave to me later. In her speaking with me and writing, she reflected back her experience of me which helped me to process the overall miraculous and awesome experience. Following the birth, we hired her for post partum help. She not only helped to care for the baby, but she did caring things for me as I recovered from the birth. She is highly skilled, as a mom, yoga instructor, and doula, and her personality is warm, caring, and non-judgmental. Even though she started out as a stranger when we hired her, I quickly felt comfortable and uninhibited around her. She was available in many ways and I found myself feeling incredibly comfortable and comforted around her. I highly recommend her as a doula..
Juliana was our birth doula for a planned home birth. She was GREAT! Her background in prenatal yoga; her cool, calm manner; and the fact that she home birthed her own daughter attracted me to her. On the big day, my husband was a bundle of nerves but once Juliana arrived (hours before the midwives), he visibly relaxed. She gave us suggestions for what to do and then immediately went to work to see if our birth tub, which we'd booked but starting from the NEXT day, was available. It was - and off she went to go get it! She helped time my contractions, encouraged me to breathe in a relaxed way through them, and provided wonderful massage and counter pressure as the pain increased. She had just the right touch and magically knew when to be around and when to let me be. Because my water had broken many hours before my contractions became regular, we were in a bit of a rush against time for me to have the baby at home. When I expressed concern about having to transfer to hospital because of this, it was SHE (not my midwives) who gave me the encouragement and faith that it would happen in time. For this, I am EXTREMELY grateful. In terms of other practical support, she helped prepare the birth tub, a herbal sitz bath and took photos for us of the birth. All in all, she was a wonderful addition to our birth team. I know my midwives felt this too. Hiring a birth doula had been a last minute decision and I cannot imagine not having had Juliana at my daughter's birth. She was an integral part of the experience. Highly, highly recommended! I met Juliana when she substitute taught for one of my prenatal yoga classes when I was already 7.5 months along. By the end of class, I had made up my mind to ask her to be our doula. I was really impressed with the way she led the class - the sequence of poses, the visualizations, her gentle and calm nature - which made me think she would be able to help me overcome my increasingly growing anxiety about labor in general and my decision to have a hospital birth. We also met a few times before my actual labor so she could meet and get to know my husband and sister (the rest of my birthing "team") and show us some helpful yoga poses and birthing postures. We were extremely grateful that Juliana was there to help us navigate what ended up being a less than straight forward and intervention-filled process. Her knowledge and composure really helped me personally keep it together as we strayed further and further from my ideal birth experience. We felt very lucky to have someone we could turn to for sound advice about interventions we never ended up reading about because we were so convinced everything would be so natural. Juliana helped us welcome our beautiful, healthy son into the world (goal #1) without a c-section (goal #3), and my husband got to experience the birth on his own terms (goal #2)...helping when he could, taking pictures when inspired, resting when he needed to but always knowing I was always being taken care of by comforting hands. This is getting long so I will end by saying Juliana also did a follow up visit about 4 weeks later to see how we were doing and showed me how to do infant massage...which our son LOVES and we now do before every bath time. So her thoughtful, caring touch is still with us and we STRONGLY recommend her if you are considering having a doula. I can recommend Juliana both as a doula and yoga teacher. I met Juliana at a prenatal yoga class and was really impressed with calming presence. I was really excited when she told me that she could also act as my birthing doula, providing the critical third leg in my home birth (in addition to my midwife and partner). She came right away when I called as soon as I began having contractions, providing me with helpful suggestions to during pre-labor. She came again the next morning when I was in active labor, helping through massage, different labor positions, using different methods to get through the pain of the contractions throughout the 2.5 days of labor at home and accompanied me to the hospital when my labor stalled! I also hired Juliana as my post-partum doula, when she came once a week for the first few weeks to work with me on regaining physical tone, breastfeeding, cooking, and just emotional support. I now continue to take her yoga classes. Just as with everything she does, her peacefulness and kindness infiltrates her classes, leaving me feeling physically and mentally grounded and refreshed.